On March 22, 2015, The Gypsy Baron, an operetta by Johann Strauss II, premiered at the Teatr Wielki w Łodzi. The performance was conducted by Bassem Akiki; stage direction and set design prepared by Tomasz Konina; costumes by Joanna Jaśko-Sroka, and choreography by Monika Myśliwiec. Those expecting an evening of infantile, light, and easy entertainment requiring little or no intellectual effort, with the production matching the libretto verbatim, were bound to suffer a huge disappointment. The creative team served the public a spectacle reflecting our modern times (even though the action is set in the 20th century from before the World Wars), with a valid message and a philosophical attitude towards the story being presented, assuming the patrons in the audience like being challenged, surprised, unsettled and can draw their own conclusions. Myself being exactly this type of a spectator, I saw the performance twice – the opening night on March 22nd, and the performance on April 29, each night with different cast. What is this Łódź Gypsy Baron like? To the sounds of the overture, the artists marched towards the entrance to a circus arena where Act One is set. Once everyone had got into their proper places – the opera choir and the children choir, and of course the soloists – the spectacle called ‘life’ began. In this act we met Kálmán Zsupán (fantastically sung at the premiere night by Przemysław Rezner), this time not a pig farmer at all, but a circus director who did have something to do with pigs, though – he was training them for appearances during circus performances. An immediate association with some businessmen of the 90’s of the past century crossed my mind. It’s performance night, full house; while the circus audience applauds what they see on stage (how true), we get to know yet another protagonist – Ottokar (opening night: Aleksander Zuchowicz) who, fighting for the love of Arsena (Patrycja Krzeszowska in both spectacles), was on a quest for a lost treasure; we also meet Sandor Barinkay, Conte Carnero, and a plethora of other characters. 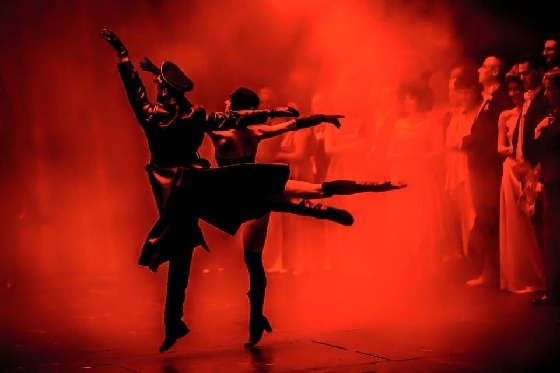 During this scene at the opening night it was Arsena’s and Ottokar’s duet – passionate and full of emotion – that captivated the audience in particular. The set design in this act felt somewhat tacky but then, unfortunately, this is the stylistics typical of most people’s experiences. Still, I must admit I only had that impression during the first time I saw the spectacle. By the second watching I already felt that the set design could not be but a tiny bit different. Why is Act 1 set on a circus arena in the first place? As I see it, life quite often resembles a proper circus, especially when the symbolic clowns and jesters appear on stage, complete with their symbolic pink and shiny confetti. To me, this act was a pastiche on the quotidian existence of people who love being nosey, who spy on others and unceremoniously pry into their lives. In one of the scenes, the chorus was playing with colourful balloons. At first, the play seemed odd to me; as it turned out, by no means was it insignificant – apparently occupied by their various pursuits, people constantly keep a vigilant eye on what others are doing. In this case, the crowd at least seemed rather friends towards those they were watching. In the second act, set at a an old parlour, we learn that the treasure was retrieved; however, since it was hidden in a derelict sofa (and not in the garden, as stated in the libretto) perhaps a more symbolic meaning might be allowed – maybe, then, the treasure was Ottokar’s and Arsena’s love, or baron’s and Saffi’s? Something less tangible but closer to us, at the same time; something that can be found right next to us, at home, at work, on stage, in the opera, or even in the orchestra. The final act transports us into a Viennese cabaret. Beautiful costumes, beautiful people, beautiful music, relax and general amusement… Also this scenes shows, and in a very intelligent way, that sometimes – overly preoccupied with our own selves, our entertainments, our ego’s whims and desires – we do not notice a true danger, which might be lurking just right around the corner. Worse yet, we may fail to spot people guided by Nietzsche’s Übermensch philosophy, and applaud them in their endeavours. 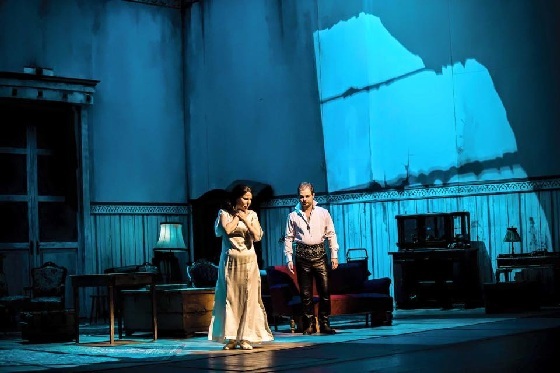 In this scene, Patrycja Krzeszewska delivered an outstanding performance of Arsena’s aria in both productions; praise is due also to Przemysław Rezner (opening night) in the role of the owner of the Viennese cabaret, and to Olga Maroszek (29.04.2015). The end of the spectacle offered a brilliant punch line. The time-honoured and well-heard waltz “The Blue Danube” (“An der schönen blauen Donau“) played a colossal and crucial part in the entire spectacle, especially in the context of the present situation in the Ukraine and recurring terrorist attacks – it is great that the team reminded the audience of all that. With that Waltz they cut right through history in a very telling way, using „Waltz” in a twofold sense peculiar to the Polish language – as a musical waltz, but also as a road roller crushing all that stands in its way. Isn’t it exactly what people do to one another, frequently entering morally dubious alliances, supporting villains and tormentors, pursuing personal gain? The music was tailor-made to the image, resonating with depth of meaning and message; the casts – well considered and designed so as to show the audiences something more (much more) than the infantile original libretto. By casting Monika Cichocka, a powerful and potent soprano and an equally strong scenic personality, in the part of the Gypsy Saffi (29.04.15 and the opening night of 21.03.15) a curious effect was achieved: with the transposition of the main focus in Acts One and Two onto this fragile and seemingly plain character, the message of the spectacle could be read as a strong statement on love – a pure and disinterested one which is our life force and remains the most important in our existence. Is the spectacle The Gypsy Baron at the Teatr Wielki w Łodzi worth seeing? Yes, if you don’t like literal and all-too-obvious performances; yes, if you expect the production to exert a lasting, haunting impression; finally, if you are into thought-provoking, memorable spectacles, by all means yes. At this point I would like to express my gratitude to the orchestra and to Maestro Bassem Akiki for a most sublime “Blue Danube” waltz which made me feel as though the music flew to me directly, and to me alone, and along with a truly ingenious choreography of the scene granted me a profound and deeply emotional experience. Thank you for every touching moment.